I think I say the same thing every year, but, I suppose, tradition is tradition. I run a lot of polling projects, crowdsourcing the FanGraphs audience, but out of all the polling projects, I enjoy this one the most. I don’t enjoy the first post; I enjoy analyzing the results. This is the results-analysis post. So often, our site supplies projections, and that’s that. If you see a projection you don’t like, you might say something in the comments or post something on Twitter, but that’s the end of it. Here, you get to have a collective voice. Not that we’re going to adjust our team projections based on this, mind you, but this is a chance to see community feedback. Here is where you can see our best projected standings, taking schedule into account. As always, those are based on ZiPS projections, Steamer projections, and manually-maintained team depth charts. Those standings have been available now for a little while, but that doesn’t mean you have to think they’re correct. So last week, I ran a post with 30 polls, asking for your input. Is a given projection too optimistic? Is a given projection too pessimistic? I’ve got everything you said in a spreadsheet. This community is more fond of the Brewers, and it’s not so fond of the Blue Jays. That probably doesn’t surprise you. After all, you, the reader, are a part of the voting community. The original post had a poll for every team. The poll asked, does the projection look very high, a little high, good, a little low, or very low? I’ve always used the same format, because I think it’s pretty easy. For purposes of analysis, I converted every answer into a number, and then for every team I was able to calculate an overall average. 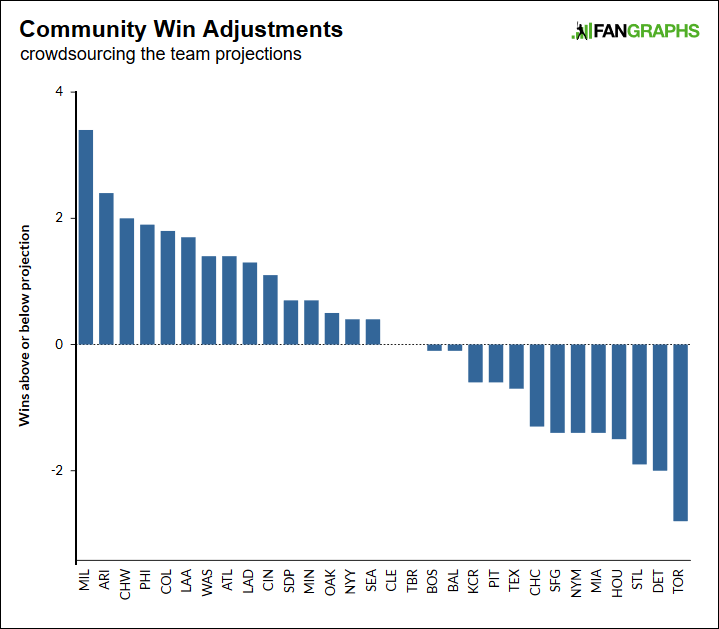 That is, an average community win adjustment, above or below the projected win total. In the plot below, you see the various opinions of the FanGraphs community. The teams on the left, with positive numbers, are thought to be underrated by the projections. The teams on the right, with negative numbers, are thought to be overrated. Got it? Of course you do. You’re smart! This is it. This is everything. There’s plenty more post below, but everything comes back to these numbers. For anyone curious, here’s how everything shook out last year. Last time, the community was higher on the Rockies, and also higher on the Brewers. This time, the community is again higher on the Brewers, and the Rockies are also there toward the left. In some ways, the community in 2017 saw some things the projections didn’t. It looks good now that the community was high on the Brewers, Rockies, and Yankees, and more down on the A’s and Angels. Granted, the community didn’t at all expect the Giants or Mets to collapse. I don’t think anyone could’ve seen that coming. At the end of the day, baseball is always going to baseball. The Brewers stand out here as the most underrated team, according to you. Last time, you thought the projections were too low on the Rockies by about 2.9 wins. This time, you think the projections are too low on the Brewers by 3.4 wins. Where the projections figure the Brewers are a few hairs under .500, you see them as more of a wild-card contender, and it’s hard to disagree, given how last season’s Brewers so overperformed. And there’s also some validation from the Brewers’ front office itself — with the front office going out and getting both Christian Yelich and Lorenzo Cain, what’s implied is that the Brewers think they’re for real. I imagine the Brewers’ own internal projections are much more optimistic than what we have on our playoff-odds page. Which isn’t to say you should always defer to authority, because teams have been wrong about themselves before, but it’s easy to see which way you collectively lean. You still don’t think the Brewers are great, but you’re more on board than off it. The Diamondbacks show up next, underrated by 2.4 wins. That’s a win less than the Brewers, but just as last year’s Brewers overachieved, so did the Diamondbacks, and in fact they even made the playoffs. Yes, it’s bad news that Steven Souza Jr. is hurt, and it could be bad news that the rotation appears to lack depth, but Jarrod Dyson is a heck of an outfield replacement, and the five-man staff is very good. I don’t need to explain this to you. You already voted. Rounding out the top five, the community is also higher on the White Sox, Phillies, and Rockies. For ten teams, the community is higher than the projections by at least one win. Looking at the other side, the community isn’t so thrilled about the Blue Jays. The Jays are in a difficult spot — they’re coming off a lousy season, and their division is still the toughest of the six. Granted, the projections take the division into account, but you can see why some people would poke holes. There are health questions about the starters, and Troy Tulowitzki is already out indefinitely. Josh Donaldson is 32 years old. Russell Martin is 35 years old. The community doesn’t see the Jays as a wild-card favorite. Beyond them, the crowd thinks the Tigers are even worse than they look. The Cardinals and the Jays might be in a similar boat. If I had to guess about the Astros, people are probably put off by the extreme nature of their very positive projection. And then the Marlins are there, more or less terrible. Every team is in that plot, so you can peruse it for yourself. For a different view of all the same information, here are the projected standings, as of when the polling project was run last week. On the left, projected win totals. On the right, community-adjusted win totals. We’ll start with the American League. The highlighted teams would be in playoff position. There’s no disagreement about any of the division winners. On both sides, the Astros win easily. On both sides, the Indians win easily. On both sides, the Yankees win narrowly. But the crowded wild-card picture does change. The differences are mostly pretty slight, but on the left-hand side, the two wild-card teams are the Red Sox and Blue Jays. On the right-hand side, we’re looking at the Red Sox and Angels. I’ve rounded everything to the nearest integer, but the difference between the Angels and the Twins works out to about a third of a win. The Jays are almost right there, and there’s another handful of teams in the mid- to upper-70s. Still room for some drama yet. Again, the division winners are identical. Neither the community nor the projections expect much of a division race in the NL. Thankfully, the wild-card race appears to be more heated. On the left, the wild-card teams are the Cardinals and the Mets. On the right, we see the Cardinals and the Diamondbacks. Within just a couple games of the Diamondbacks: the Mets, Brewers, Rockies, and Giants. The Phillies are just five wins away. The Pirates, seven. I should note, between now and when the initial post went up, Madison Bumgarner sustained a significant injury that will cost him several weeks. I imagine that’s at least partially reflected in the community voting. The Giants’ current projection on our playoff-odds page is also down from where it was. It’s moderately interesting to see that, according to the community, the Dodgers are a whisper better than the Cubs, even after Justin Turner got hurt. Also, while I’m here, the Astros and Angels got the most total votes, which is a consequence of their showing up so early in the polls, which were arranged in alphabetical order. The Yankees’ poll was last, but that poll still got more than 200 more votes than the poll for the White Sox, which came just before. The Yankees are popular. Thank you for reading FanGraphs! As the last thing to offer, here’s a big and sortable table. This just shows the voting distributions for every team, and the number highlighted in yellow is the most popular selection. For 19 of 30 teams, the most popular selection was the middle one. That shows general agreement with the projections. For five teams, the most popular response was that the projections are a little high, and for the remaining six teams, the most popular response was that the projections are a little low. Whenever I’ve run this polling project, I’ve detected a whiff of overall optimism, to the tune of +0.2 wins on average. Obviously, teams can’t all win 0.2 more games than projected, but this optimism has been consistent and it’s hardly out of control. It’s been +0.2 every year. The most popular single response: 58% of voters believe the Indians’ projection looks good. The team with the lowest high, if you will, is the Giants, with a maximum of 36%. The A’s have a maximum of 38%, while the Braves are at 39%. I interpret this as an indicator of uncertainty. The Giants have just had a major injury, which complicates things. But you can see why the A’s and Braves might get responses across the board. At last, the lowest minimum: Just 0.3% of voters believe the Blue Jays’ projection is very low. And just 0.5% of voters believe the Brewers’ projection is very high. Thank you all one more time for your participation. I love you all oodles. We hoped you liked reading Here Is What You Think of Our Team Projections by Jeff Sullivan! The wisdom of the crowd doesn’t seem to match the positional power rankings when it comes to the Astros. 101 wins might be too low. Not sure why this is being downvoted. It’s true. Though it seems unlikely that they would push themselves too much higher than 100 wins when that would almost certainly be enough to win the division with ease, and taking their foot off the gas pedal would allow them to rest their starters more for a deep postseason run (especially after rosters expand). Good point, if the season did in fact emulate the projections, they probably would down shift in late September. Maybe the projections factor that in (probably not). Then again, there’s also an advantage in September when you play the non-contending teams who have become even worse after trading away some of their better players. I mean, there’s always more downside than upside when you get to that level, whether you look at a team or the individual player projections that make up the team projection. The downside is more severe, but a slight upside is more likely to happen to balance the projection odds.